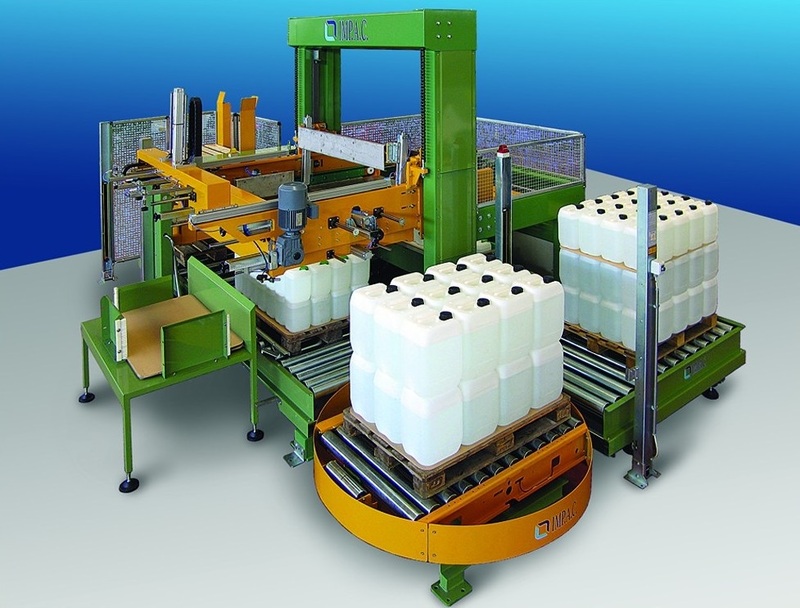 This palletizer is a high speed, fully automatic unit suitable for palletizing tanks up to 2100 tanks/h. Each incoming carton is orientated and transferred to the layer preforming section. The completed layer is then transferred to a layer loading mechanism which elevates the layer and moves it horizontally until it is positioned over the pallet. A sliding gate then opens and deposits the layer onto the pallet. This cycle continues until the pallet loading is completed. The filled pallet is then automatically transferred to a holding conveyor and an empty pallet is simultaneously moved into the loading position. The entire operation is controlled by a PLC, which can be programmed to palletise cartons of different dimensions, layers pattern and number of layers.